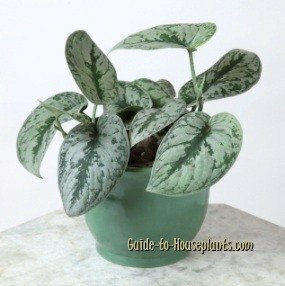 Satin Pothos is just as easy to grow as its relative, golden pothos (Epipremnum aureum). Keep it warm and take care not to overwater this house plant. Cold drafts and soggy soil are two things it won't tolerate. 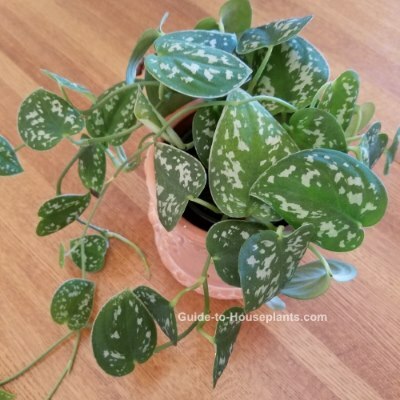 You'll see the best leaf color and variegation by keeping this pothos plant in bright, indirect light. You'll also keep this plant healthy by boosting the humidity around it. In fact, its variegated foliage makes this plant a beautiful addition to a terrarium. This striking tropical plant is fairly new to house plant nurseries, and is garnering a lot of attention. Big, heart-shaped leaves are dark-green and splashed with silvery gray, giving them a satin sheen. Its compact growth habit makes Scindapsus pictus 'Argyraeus' a beautiful hanging basket plant. Pruning tip: Your plant will benefit from occasional pruning, which helps it to branch out and become fuller. Spring is the best time to cut it back. Use sharp pruners to avoid tearing the stems. Repot in spring when the plant outgrows its pot. Use a pot only 1-2 inches bigger, because a much larger container will hold too much water. Pothos problems usually show in its leaves. Brown leaf tips are caused by dry air. Yellow leaves are a symptom of too much water. Brown spots surrounded by yellow halos indicate bacterial leaf spot. Cut off affected leaves. Take care not to get the leaves wet when watering. Height: Trails to 3 ft (90 cm) or more. Light: Give Scindapsus pictus bright, indirect light year-round. Harsh direct sunlight will scorch its leaves, while too-little light will cause the leaves to lose their variegation. Water: Water thoroughly and allow the top inch of soil to dry out between waterings. Keep soil barely moist in winter. Yellow leaves are a symptom of overwatering. Provide good drainage. Humidity: Try to maintain 40-50% relative humidity around your plant. Use a room humidifier or a humidity tray in winter. Temperature: Average to warm 65-85°F/18-29°C. Don't expose Satin Pothos to temperatures below 65°F/18°C, even for a short time because cold air will damage the foliage. Soil: Use all-purpose houseplant potting mix. Fertilizer: Feed monthly spring through fall with a 20-10-10 liquid fertilizer diluted by half. Propagation: Take 4 inch (10 cm) tip cuttings in spring or early summer and insert them into moist peat moss based potting mix.